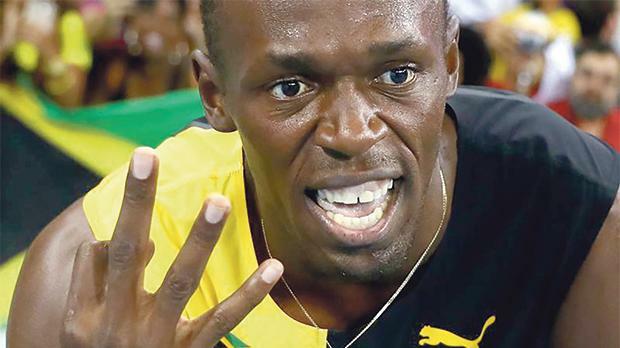 Usain Bolt’s ‘treble treble’ was dented after team-mate’s doping. Sprinting great Usain Bolt is refusing to dwell on the disappointment of losing his Beijing Olympics 4x100 metres gold medal after his Jamaican team-mate Nesta Carter tested positive for a banned stimulant. Bolt, who completed a remarkable ‘treble treble’ of 100m, 200m and 4x100m Olympic titles at the 2016 Rio Games, had his 2008 relay gold stripped last month after Carter’s re-tested sample indicated he had taken methylhexaneamine. The International Olympic Committee (IOC) ordered Carter, who has already said he would appeal the decision to the Court of Arbitration for Sport (CAS), and team-mates Bolt, Asafa Powell and Michael Frater to return their medals. “Initially (I was) disappointed, of course,” Bolt told reporters at Melbourne Airport as he arrived ahead of the Nitro Athletics series. “But in life, things happen. I’m not sad... I’m just waiting to see what’s going to happen. Powell, who served a six-month doping ban for a positive test in 2013, was as phlegmatic as his storied compatriot. “It’s very unfortunate and we have to look to the future. We’ve accomplished a lot and we just need to be positive about everything right now,” Powell said. Bolt will lead an international team of “All Stars” in the Nitro Athletics series in Melbourne against four other teams representing England, China, New Zealand and Japan. The first meeting is this weekend with the other two on February 9 and 11.